Preserving photographs within the museum’s collection is one of the many tasks performed by the Registration Department. Learning and staying updated on current preservation techniques helps me with that task. On July 25, I attended a workshop in the Museum’s classrooms cohosted by the Museum titled Preserving Your Photographic Collections. It was presented by the Conservation Center for Arts and Historic Artifacts (CCAHA) as part of their Collection Care Training Programs. This program was graciously funded by the William Penn Foundation, the Philadelphia Cultural Fund, the Independence Foundation, and Sovereign Bank. 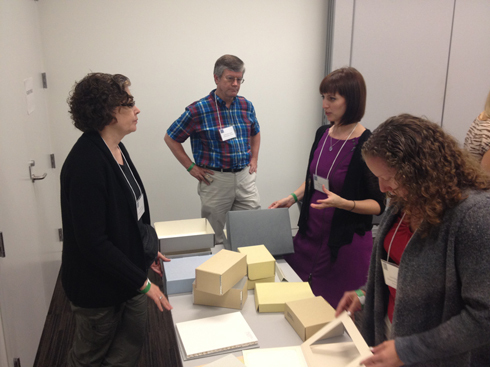 This is the fourth time NMAJH hosted a CCAHA Collections Care Training program. Forty people traveled to NMAJH and participated in this intimate workshop led by Rachel Wetzel who is the Photographic Conservator at CCAHA. Participants came from a wide range of institutions such as small historical societies to larger museums from all across the country. One attendant traveled all the way from Colorado! All came eager to learn how to properly house, care for, and store their photographic collections. While learning about photography can certainly take more than one workshop, Wetzel described the history of photography, specific terminology, proper handling, and safe long-term storage of photographs, slides, and negatives. Examples of the different types of storage containers and materials were on hand for everyone to see and ask questions. More information on the CCAHA’s Collection Care Training programs can be found on their website www.ccaha.org/education. At the top of our entrance ramp is a display case where we like to exhibit new acquisitions as well as old favorites from our artifact collection. 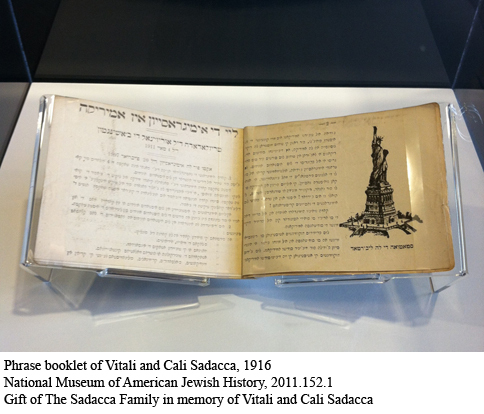 This summer, we had the opportunity to display a pocket-sized phrase booklet that was used by Sephardic Jews Cali and Vitali Sadacca who emigrated from Constantinople in 1910. The Judeo-Spanish speaking Sadacca family, which settled in Cincinnati, used the side-by-side English, Yiddish, and Judeo-Spanish phrases and sentences in the booklet to communicate with English and Yiddish speakers in their new homeland. The booklet was published by the Judeo-Spanish (sometimes called Ladino) journal La America, and in addition to useful phrases it contains advice on immigration law and American life, as well as advertisements. To me, the progression of the main list of phrases and sentences in the book is really interesting. The list starts out with mundane, necessary language that immigrants might need to navigate an unfamiliar city – such as that needed to rent a room in a boarding house – which give way to sentences that one would need to find employment. The sentences soon become more focused on factory work. The last pages become increasingly labor-oriented, ending with English, Yiddish, and Judeo-Spanish translations of the sentence “Union is power.” This illustrates the importance of factory work among immigrants at the time, as well as the significance of labor unions in the United States. It also tells us a lot about the publication’s political inclinations. In July, we displayed the booklet open to a section about immigration law that includes a drawing of the Statue of Liberty, a patriotic nod to the July 4 holiday. The page has been turned so that it’s now open to a list of sentences, and this week is your last chance to see it on view until it is reinstalled elsewhere in the Museum at a future date. After a tremendous three-month run, our first special exhibition, To Bigotry No Sanction: George Washington and Religious Freedom closed on Sunday, September 30. The cases have been returned to storage and the walls have been repainted, and our last batch of more than 400 letters to President Obama has been mailed out. But the exhibition lives on in many ways. 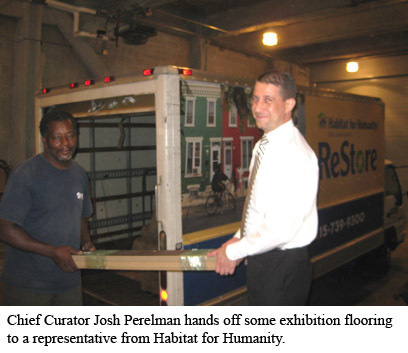 We’ve donated the exhibition flooring to Habitat for Humanity’s Restore where its sale will help fund the construction of homes in Philadelphia. Our letter interactive and walking tour are still accessible online and teachers are continuing to use the exhibition curriculum to teach the origins of religious freedom in their classrooms. The letters between George Washington and the Hebrew Congregation will return to our core exhibition next summer. Lastly, our director, Ivy Barsky’s very own fig tree continues to grow in her yard and we all look forward to one day sitting under it in safety!